Last weekend I lived the ultimate bread bakers’ dream. Thanks to my friends at Red Star Yeast I travelled to the heart of wheat country in Kansas and had the great honor of judging the National Festival of Breads baking contest. The contestants submitted their recipes and were chosen from hundreds of bread bakers from across the country. Eight women came to Manhattan, KS and baked in a theatre-style kitchen in front of about 1,500 bread lovers. They deserve a prize for that alone. The breads were all amazing, but one by Lisa Keys of Good Grief Cooks was the one that stood out to all the judges. Her Smokehouse Cranberry Cheese Bread had a combination of flavors, texture and beauty made this the clear winner. You can read all about the contest (you should consider entering for the next one), the contestants and their winning recipes at the National Festival of Breads. 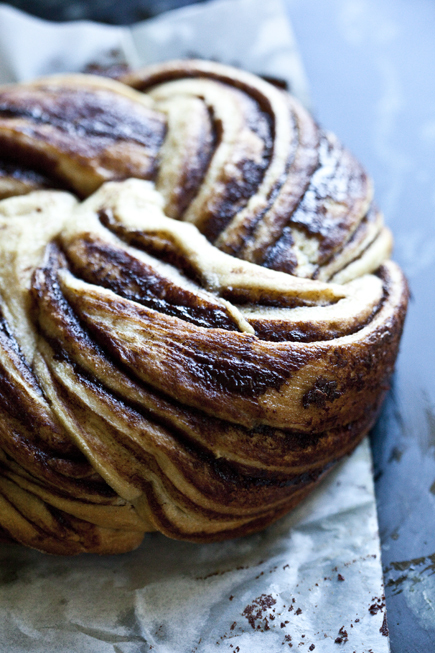 Another absolutely gorgeous loaf that was baked for us was a chocolate swirl bread. 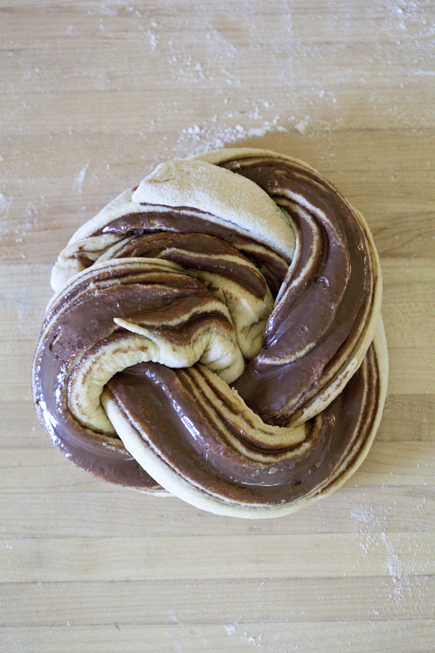 I’ve recreated that idea with our Whole Wheat Brioche dough and a swirl of Nutella. It is healthy and decadent all at the same time and it’s baked in a crock-pot. I turned to my crock-pot when I turned on the AC for the first time yesterday and I really didn’t want to heat up the kitchen by cranking up the oven. 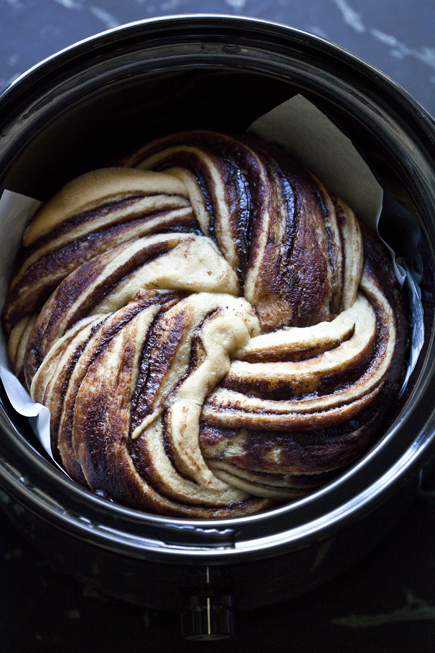 The crock-pot is ideal for this Nutella swirl bread, since it fits the shape and we want a soft crust. The result was perfect. 1 1/2 pounds brioche or challah. The doughs from The New Artisan Bread in Five Minutes a Day or Healthy Bread in Five Minutes a Day or Gluten-Free Artisan Bread in Five Minutes a Day will work equally well. 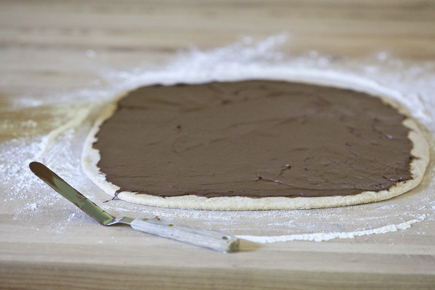 Roll out the dough to 1/8-inch thick rectangle and spread the Nutella over the dough. 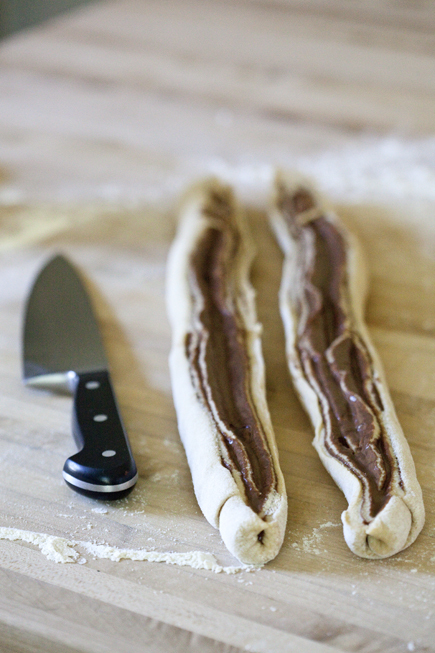 Roll the dough into a log and pinch the seam shut. Cut the dough in half down the length of the log. 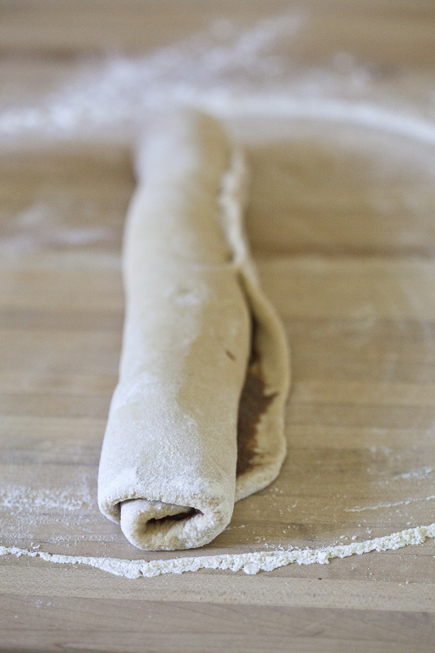 Twist the dough into a rope. Coil the twisted rope to form a tight round loaf. Tuck the ends under the loaf. Place the loaf on a piece of parchment paper and set into the Crock-Pot. (No need to let the loaf rest or rise before you put it in the crock-pot and start it up. Super FAST and EASY!) Place the COVER on the crock-pot and turn to high. Let the bread bake for about 1 hour, but this may take slightly shorter or longer, depending on the machine. The loaf is done when you touch the top and it feels set and no longer mushy and raw. Remove from the crock-pot. Allow to cool before eating. (I have to say that, but we couldn’t wait and ate it warm). Oooo!! I LUV Biscoff cookie spread, crunchy. What a fun idea . Definitely have to give this a try!! yum! Would it work with your gluten free brioche? Any adjustments? Yes, it sure will. I would actually suggest the GF challah from GFABin5 if you have that book. 1) Best time frame to mix and refrigerate the dough before shaping and baking? 24 hours? More? 2) I have a 6-quart oval slow cooker. Might there be any adjustments in quantity of dough or in shaping the loaf? I made one after the challah dough was refrigerated for just 3 hours and then another one today, when it was thoroughly chilled. It took a tiny bit longer to “bake” through today, but not much. I think your 6-quart will work just fine. Your bread will be an oval, but that will be lovely. if you used pre-refrigerated NG whole grain loaf, like the buckwheat or millet recipe, do you rest at room temp before baking it in the crockpot? 35 to 45 minutes at 350 degrees? Also, I really like the ring idea, what are your thoughts on baking this shape, but just on a cookie sheet? Same time/temp as with the loaf pan? The directions say to roll into log – it shows one roll. Then cut lengthwise down the log – the picture shows 2 logs. The rest of the pictures seem to show 2 logs. Did I miss a step? 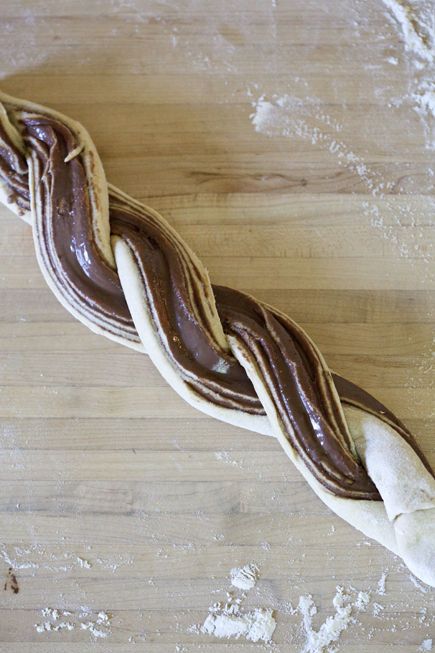 You will roll up the dough after you put the nutella over it. This will give you one log. Then you cut that log into two, by slicing it down the length of the log. So, in the end you have two logs that you will then twist. That’s how you get the lovely layers of the chocolate spread. Zoe, Thanks for your fun and educational baking session at the National Festival of Breads. There was not an empty seat to be found during your session! We enjoyed having you on the judging team too. Your bread looks amazing! We enjoyed hosting you in the “Wheat State” and the “Breadbasket of the USA”. I had a wonderful time and was so impressed with the festival and all the bakers. What a wonderful event you all put on! Yesterday, I had commented on one of your posts about making Belgian waffles with the brioche dough and how good they were. Today, I made them again but after flattening balls of dough,I let them rest under a towel about 1 hour. They were even better, much higher. I even tried doing a liege style waffle. I made “pearl” sugar and they were also yummy. Ordered your latest Bread in 5 today. After having a brioche donut at CIA,Hyde Park (I am fortunate to live near) my quest for a recipe led me to you both. I believe Zoe is a graduate? Can’t wait for my book to arrive. This looks DE-licious. I can’t wait to make it for a brunch tomorrow. Do you have a recipe for the challah/brioche? Thanks so much! can’t wait to try it! Yesterday I was cooking with my 6-year-old-son (fun but always chaotic). 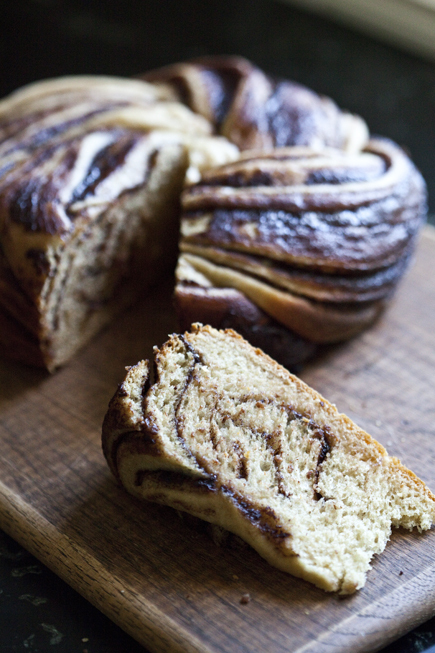 We were mixing up the brioche in your first cookbook on page 189 for the first time. I forgot to put the water in! I thought it looked a little dense, but didn’t realize it until I got it out to bake today. Is there any way to rescue the 8 eggs and 3 sticks of butter? It seems like it might work as a pastry dough. I’m guessing you may be able to work the water into the dough. Or maybe a little more water than is called for, then add in some flour to normalize the hydration. It should work. Hello, I am interested in purchasing your ‘Gluten Free Bread In Five Minutes’ book and I would like to know the ingredients in your gluten free mixture #2. I live in a remote area and it is difficult to find some of the ingredients needed for gluten free baking. I already own a few gluten free cookbooks that I can’t use because I can’t source the ingredients. Actually should have said that everything except the psyllium is Bob’s brand, with the psyllium, it’s whatever’s available in your coop or health food store, it’s hard to find. Bottom line: many readers end up ordering these from Amazon or elsewhere on the web. Thrive has good prices on Bob’s products…just a thought. 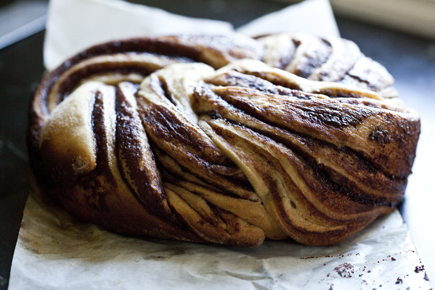 Off topic from this post (though I am now planning to make this bread with the challah dough that’s in my freezer). I’m using “The New…” and want to make the bread, but haven’t found the flour where I shop. I live in the Twin Cities. Can you tell me where I can go to get rye floor (preferably SW metro)? Thanks. I think Whole Foods and the Wedge co-op sell it. You may also have luck at the Cub foods. 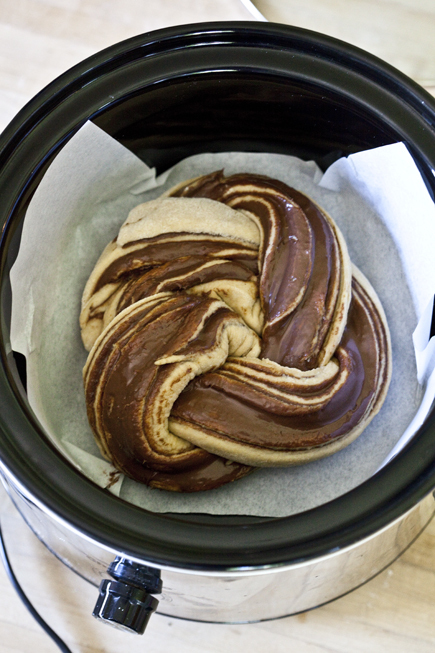 On topic–Moved a pound of challah dough from the freezer to the fridge last night, made the crock pot nutella swirl this afternoon. Indeed, it was spectacular–thanks for the recipe. Also, first bucket of rye bread dough is on the counter–thanks for the recipe and the shopping tip. I can’t wait for some buttered, just slightly toasted rye! 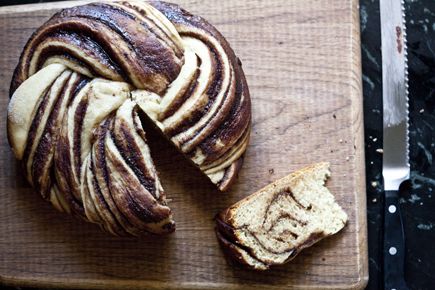 So glad you enjoyed the swirl bread. Hope you like the rye as well. So….. maybe I used more dough than I should have? Because while it certainly looks like it should and seems to be turning out nicely and yes, my crockpot is on high —- its been in there for 3 hrs now and probably has another 30 min or so. Im thinking I used just way too much dough…. Yeah? Really excited regardless! I’m sorry I missed your question earlier. I hope the bread came out ok in the end. The larger the dough ball the longer it will take for sure. You may want to try one that is slightly smaller next time and see if the results are any different. It could also just be that your crock pot runs differently than mine. I’ve baked in several and some take an hour and others take 2 1/2 or more. Glad I saw this again, as my bread was a large one, for the crockpot, and was no where near done after 80 min. I added 20 min to the timer, but looks like it could take longer, if hers took 3.5 hours! The dough was really moist, like thick, thick waffle batter when I plopped in on parchment paper. Next time I would use the taller, narrower pot. And I think I will get a tall like D. oven, soon, so the spread is not wide, and I can keep a taller loaf and maybe won’t do a crockpot again…wish me luck. Thanks for your replies today. Awesome recipes and extraordinary web site with innovative and unique recipes. I can add any recipe you like of yours on my page called “Polly’s Bake Shop”. My crock pot is Digital and has high or low settings. 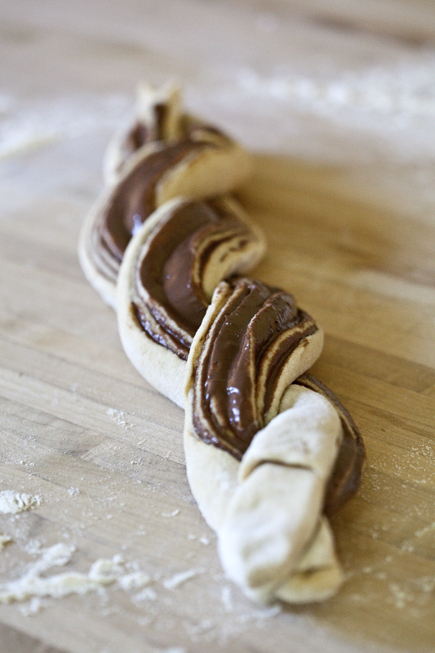 What do you suggest to bake the Nutella Swirl bread? I also have a very old round one that has a controlled thermostat by temperature. I want to try that. I will throw put that big, clunky R2D2 DAK bread maker! Each crockpot is a bit different, but I always use the high setting for baking bread. It has always worked well for me. Give that a try and let me know how it goes. I guess my crock pot’s ‘high’ setting is really high. I baked the bread for an hour and a half and it was till soft and looked uncooked. My setting are either High 4 and 6 hours or low 8 and 10. I ended up with a seriously burned loaf. I’m not sure if I should try the low setting next time. Any thoughts on using a dutch oven? I was thinking about putting the bread in a cold dutch oven and then into a cold oven. Set oven at 250 for 45 minutes. I was figuring a slow rise to the final temp and also taking into consideration that the pot has higher heat conduction. I don’t have a crock pot. I think it is an interesting experiment, but the final temperature may be a bit low to cook the bread completely. If you give it a try, please report back. I did. I just like the shape and the soft top on the crock pot version. Thanks!! You could use the oven instructions, but instead of using a regular loaf pan, just use the Dutch Oven as your baking vessel. At 1 hour the dough was very raw but rising nicely so just let it go until top was lightly firm to the touch. (Took over 2 hrs) Was still pale so planned on putting it under the broiler for a minute. When I took it out of the crock pot, one side looked absolutely perfect, but the bottom and other side were positively burnt. Temp inside was just at 200 degrees. Cut a few slices from the non-burnt side and it was amazing!! The rise was beautiful as well… far better than I get in the oven or even in my Dutch oven. Is there something I did wrong or is this likely to be the fault my crock pot heating unevenly? If I wanted to cook this in the oven… how would I go about it? 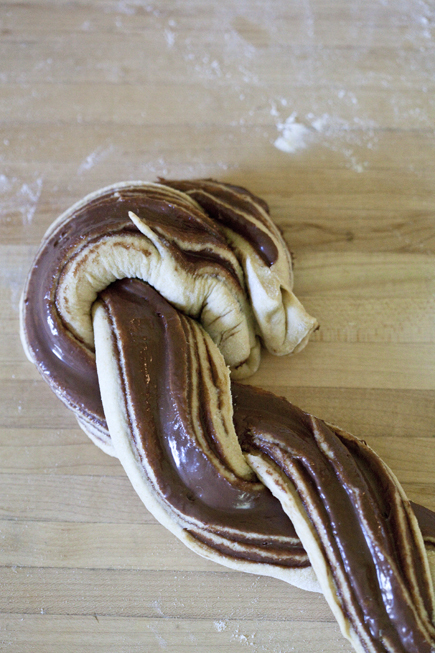 I feel like high temps will burn the sugars in the challah (honey) and Nutella. Please help as my family loved the flavor on this! Yes, you absolutely can bake it in the oven. After you shape the loaf, let it rest, covered in plastic, for 60 minutes. Bake for about 30 minutes at 350°F. If the bottom was only burnt on one side, then your crock pot doesn’t heat evenly. You can create a little pillow of foil to lay the bread on, which will insulate it from the heating elements and help even out the baking, but it may take even longer??? Thanks Zoe! I found the oven recipe and tried that with my remaining challah dough. Cooked in a stoneware piece because I wanted that same wreath type effect but without it spreading all over the place. Didn’t rise as nicely as the crock pot one and tasted far more chocolatey. Good, but different. I’m going to try another crock pot and see if it does better. I appreciate the help! Great experimentation–sounds like you’re on the right track. I have a question: I have baked many of your recipes from the New Artisan Bin5 in my brother’s old crock pot when we were staying with him last year—his oven was not working except for the broil feature. It certainly worked, although I was just a bit underwhelmed– I have wondered whether it was due to the actual functioning temperature-wise of the pot itself. I do love the idea of cutting back of high heat oven time during the hot months, however, so I was seriously considering purchasing a new crock pot (I have an ancient one myself purchased for $6 years ago at a thrift store). But it just occurred to me that I could use my recently acquired Instant Pot on the slow cook mode, too— any insights would be welcome from your perspective. Elizabeth, people have been asking us about the Instant Pot, but neither of us own one, so can’t comfortably advise you. Sorry! Also, should check with the manufacturer to make sure it’s safe to do something like this without liquid in the pot. Good point! I only acquired my Instant Pot a couple months ago, and have only used it for cooking conventional foods that require liquid. My real concern is to have a slow cooker/crock pot that matches up closely with the performance of the appliances that you and Mme. Francois use– I do think our elderly crockpots (ie, both mine and my brother’s) probably leave something to be desired in the temperature department. From scrutinizing the photos for recipes on the site– and the Amazon links that pop up– it looks as if you use a standard Rival Crockpot with no bells and whistles? Elizabeth, Zoe’s crockpot is actually a West Bend (no bells and whistles). Ack! If your Crock-Pot has a timer, (like mine,) set yourself another timer, something that makes noise to remind you to check and adjust your cooking. Mine went off after 1 hour and I’d wandered off to do something important, like clean the hall closet. Bread deflated into dense mess. I tried to salvage by finishing in the oven, it did recover a little and browned up a bit, but still wasn’t much of a bread. Not wanting to waste all that effort I chunked it up, let it dry a couple of days and made bread pudding. Makes a great bread pudding and a disaster turned into kudos from my husband. Fantastic Sherry! The other problem is that all crock brands perform a little differently, so it might take some experimentation. Gluten-Free in Five in the Portland Press Herald!